With a relaxed, modern drape and the durable softness of Icebreaker's corespun fabric, the Aria Short Sleeve V Wing provides the reliable comfort of your favorite tee with a classic deep V-neck design. Their corespun fabric uses nylon fibers wrapped in merino wool for added strength and durability that retains next-to-skin softness. The Aria’s droptail hem offers added coverage and the capped sleeves with dropped armholes add a unique, airy touch. 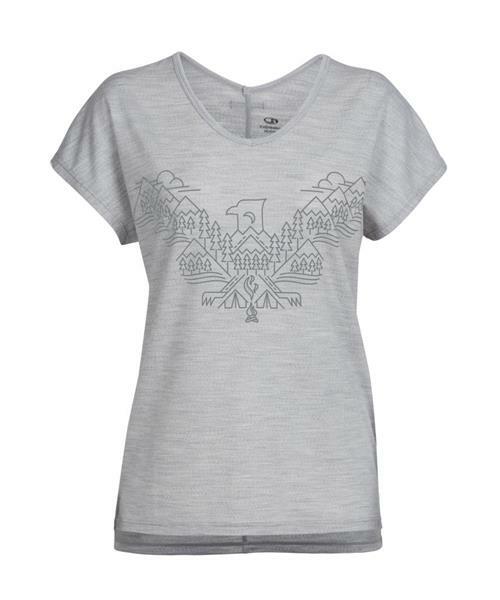 The nature-inspired graphic art provides a needed dose of mountain inspiration. Aria SS V Wing - Womens is rated 5.0 out of 5 by 3. Rated 5 out of 5 by littlemissadventure from Great flattering cut I own a lot of Icebreaker tops but I'm a big fan of the more relaxed fit tops they've released over the last few years, like this. The fit is flattering (or it is for me at least) and stylish. I don't particularly love the colours available for this top but the greyish one is still nice enough and the pattern is also nice. V neck is far more flattering for many women than the small/higher neck tops Icebreaker also has (eg the Nomi S/S prism top is gorgeous apart from the tight neckline, which doesn't flatter many body types). I fit an XS in Icebreaker but usually choose S for a looser fit; because this is a pretty relaxed fit I think normal size or sizing down might be OK too. Would love it if Icebreaker kept doing relaxed/ drapier clothes but with more colour options and nicer necklines (v neck, scoop, boat) please! Rated 5 out of 5 by ToTheMtns from Comfortable! Bought this shirt and love it! I used to always be a Medium in Icebreaker, but the sizing has changed this year and now I'm a Small (and it could stand to be a touch smaller still). I like my clothes fitted but not tight. Always happy with the Icebreakers quality and it looks good wash after wash. Rated 5 out of 5 by AudreyKiiwii from Versatile I love this piece as it can be worn outside with leggings casually, or with nice pants & a jacket at work. Fits well and the design is eye catching. Had many compliments about it!